Mix oyster sauce, shoyu, and sesame oil together in a bowl and set aside. 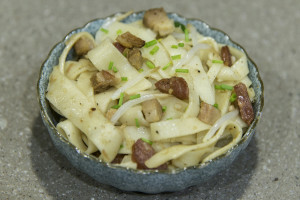 Pan fry Lup Cheong and roast pork over medium heat in a flat-bottom wok or frying pan. When the Lup Cheong and roast pork start to sizzle, add chow fun noodles. Add the sauce and toss altogether. Add bean sprouts and green onions. Cook until just wilted. Season to taste with ground pepper and serve.